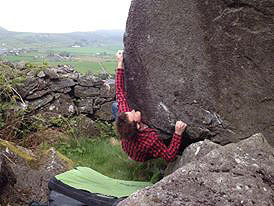 Alex Mason has climbed a tough micro problem on the Pant’s Traverse block at Mynydd y Graig. Fancypants 7C tackles the left arête from a sit down start, finishing up past the starting jug of the Pant’s Traverse. A link into the traverse would also be possible. Fans of the new wave of dolerite problems in the Rhiw area will be saddened to hear of the demise of one of the best of the new crop of problems. Down at Far Nefoedd the hanging prow of Point Break 7B/+ has parted company with the mud cliff from which it once protruded. It now sits forlorn, and from a bouldering point of view, somewhat redundant on the pebble beach. First ascencionist, Jon Ratcliffe was said to be inconsolable in his grief for this lost classic. The moral of the story is clear: get in quick before Mother Nature changes her mind. 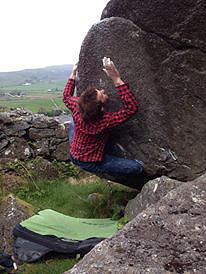 For more info, pics and a film of some of the recent Rhiw stuff check out Owen Mcshane’s excellent Skinnydogbouldering blog.